Presidents Day is coming up on February 18th, 2019. With politics taking over every second of our lives these days, I got to wondering–what if your cat could run for President? Elections would be a whole lot cuter; that’s for sure! It would also mean campaign promises that include a lot more sleeping and catnip. Does your cat have the brains to run for President? Do they have the skills to tackle a Presidential debate? In our fictional world, these ten cats would definitely make the cut to be the next President of the United States. An essential quality of a President is taking care of the people around you. How can you be a leader if you don’t have the compassion to help your fellow man? This cat is the perfect example of how to be a great leader. Pumpkin the cat is the most kindhearted kitty you’ll meet. Pumpkin lives as a member of the staff at a shelter and helps comfort new animals when they are brought in. Whether it’s a wild goose, a rat, a dog, or a fellow cat, Pumpkin is always there to make sure they are welcome at a time when they’re most scared. He greets everyone, letting them know they are in good hands and will be safe and fed well. Pumpkin doesn’t want any of his fellow animals to feel scared and is always there for them, no matter what. If you’re going to make it as President, then you’re going to have to know how to debate. Debating is the key to any Presidential election because it lets the people know if you have what it takes. These two cats have mastered the art of debate. There are no interruptions or speaking out of turn. They casually have a conversation back and forth, letting each other meow for a respectable amount of time. However, these cats might actually be debating whether the bird outside the window is within their reach, rather than about serious economic policies. Then again, that’s what happens when cats run for President–birds become a key issue of the race. The President of the United States must be patriotic about his or her country. To be President, you must love your country, and you must know the Star Spangled Banner. This cat definitely has the patriotism to be President. As her owner sings the National Anthem, the cat meows along perfectly in sync. She doesn’t miss a beat, meowing along to the entire song. 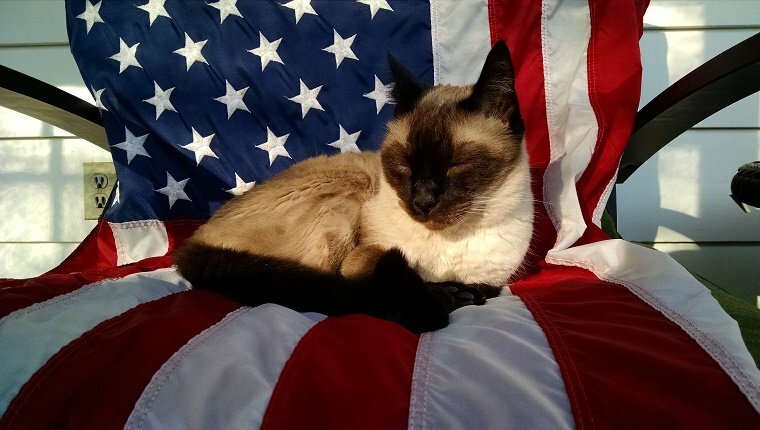 It is very obvious that this cat is a patriot that loves her country. The President cares for everyone in the country, including those with disabilities. The President must promise he or she will do everything in their power to give those with disabilities the care and access they need. That’s why this cat has what it takes. This cat wants to help everyone, even those who may have a slight disadvantage. He helps his doggy friend, who is blind, by guiding him along the road. The cat stays by his side to make sure the dog knows where he is at all times so he is safe. This cat is the perfect example of someone willing to take action to help those whose lives are different. If he were running for President, this video would be the perfect campaign ad. The President is the Commander in Chief, which means he or she must do everything in their power to keep the country safe. You want a leader who knows how to protect and defend the country. This cat is the ultimate protector. In one of the most famous and talked about cat videos, this feline saves his human from a dog attack. The minute the dog bites the little boy, the cat comes running in, pushing the dog off his little human and coming to the rescue. This cat didn’t care that he was going up against a big dog; he wasn’t scared because he was doing his duty. This cat definitely has what it takes to defend his country because he’s willing to put his life on the line for his human. While golf skills aren’t formally listed as an official rule to become President, it seems that every President likes to golf. From President Nixon to President Trump, golf has continued to be a tradition of the White House. That’s why this cat’s golfing skills would definitely make him eligible to be President. Every time his owner hits the golf ball, the cat immediately attacks it, kicking it with his back legs and whacking it with his paws. While this cat may not be the most professional golf player, you can’t deny that it’s extremely cute. If this cat became President, he would advise that the rules of golf be changed to fit a cat’s standard of playing. The chair of the President is one of the most famous chairs in the world. It’s where some of the most important decisions are made and where some of the most important phone calls have taken place. With that being said, just as the President has a famous chair, cats are infamous for stealing their owner’s chairs and then claiming them as their own. It’s the perfect combination because cats already know what it’s like to have their own special chair. This cat especially loves to steal his owner’s rocking chair. He even looks like a President, sitting on his special pillow as he rocks back and forth looking regal and elegant. The Presidential chair is just waiting for this cat to claim it. One of the President’s main duties is taking charge to create change in the country. He or she must demand change and action so that new policies can be created. This cat has mastered the art of taking charge. He knows exactly how to get what he wants. While his owner does work, the cat continues to bother him for attention and loving. This cat doesn’t give up, taking charge of the situation by climbing on his owner and sitting in his lap. This cat is persistent; that’s for sure! He just wants some cuddling–is that too much to ask for? While it may be annoying, persistence and demanding action are traits that make this cat a perfect contender for President. Having friendly relations with other countries is an important task for the President. To keep peaceful relations we must maintain diplomacy. This cat knows exactly how to reach across the aisle. While it’s assumed that cats and dogs may be mortal enemies, this cat knows how to prove the naysayers wrong. Instead of fighting with each other, this cat and dog are all cuddled up together. Just because they are different species it doesn’t mean they can’t have a loving relationship. These two cuties cannot stop snuggling together! Now that is how you maintain diplomacy. Presidents are always on the go. Whether it’s flying to a different country or staying awake to make an important phone call, a President has to be able to catch some sleep anywhere, at any time. Without sleep, how are you going to make smart decisions? That’s why these cats are the perfect candidates for President. No matter where or when, these cats are able to sleep. Sleeping is their art form. They’re the masters of sleep. Presidents never know where they are going to be, which is why these cats are experts because it doesn’t matter where they are or what position they are in, they will always manage to catch some z’s. Does your cat have what it takes to be president? Let us know and leave a comment below!